Homemade Ninja Foodi Garlic Fries are going to rock your world. Homemade crispy fries that have warmed chopped garlic, parsley, parmesan cheese and salted for the perfect amount of flavor. Stadium worthy garlic fries to the rescue! No need to run to the stadium, make them at home in no time. I may start every post with going on and on about how much I love my Ninja Foodi. After being a seasoned Instant Pot user and lover, I fell in love with my Foodi the very first time I used it. The subtle and not so subtle changes from the Instant Pot are so exciting. I love being able to air fry in my Ninja Foodi. The very first thing I cooked were my delicious Instant Pot BBQ Ribs. 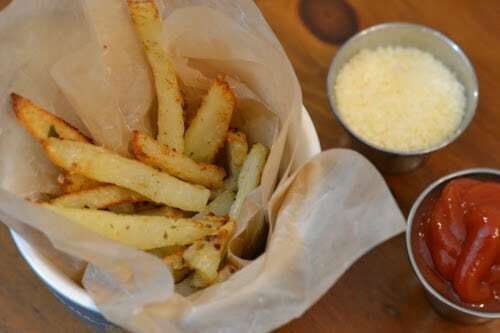 They crisped up so beautifully I knew that I needed to make my world famous garlic fries in the Ninja Foodi. These Ninja Foodi Garlic Fries will be made weekly now. My husband loves homemade french fries. I agree that they are delicious but I never was thrilled to get out the deep fryer and deal with all that grease and mess. Now he can have homemade Garlic Fries anytime he wants. Now with the Ninja Foodi I can cook the fries with the Instant Pot feature to help soften and slightly cook the potatoes slices. Then toss in your toppings, stir, and turn on the Air Fryer feature. This will help crisp up and give your fries that deep-fried texture, without the oil. Talk about delicious flavors all in one fry. 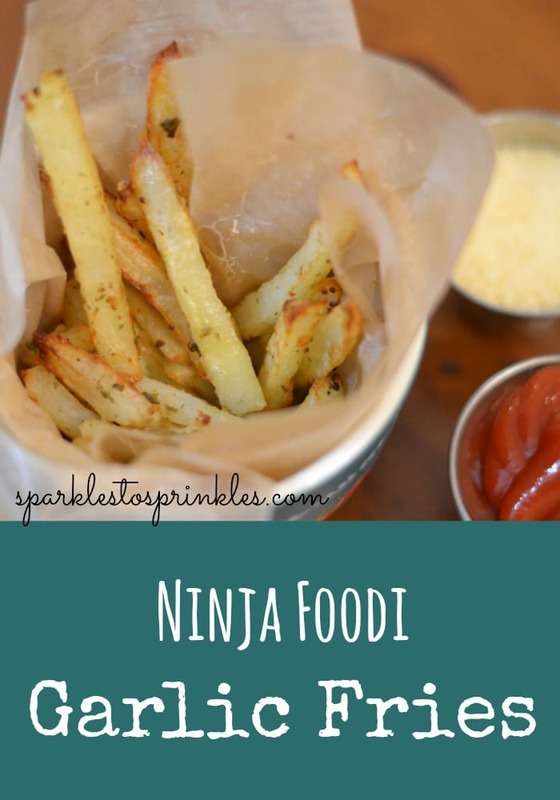 These fries are so easy to make in your Ninja Foodi, I will for sure be making these over and over again. Pair with some juicy burgers, chicken tenders, or even a hot dog or fish sandwich. These garlic fries pair well with really almost any and everything you can think of. Or serve as a snack, either way, your taste buds will go bonkers for these fully loaded garlic fries. I call these Ninja Foodi garlic fries a ballpark-style french fry because so many stadiums sell garlic fries. These fries are outstanding in flavor with crispy and tender fries, garlic flavor in every bite, and just perfection. This homemade garlic fry ballpark style recipe is so similar to what you get handed when you place an order at a stadium. Except these beauties are affordable, quick to make, and you can eat in the comfort of your own home. In the Ninja Foodi we start by pressure cooking the potato slices. Once that is done add in your garlic, parsley, and other ingredients and stir well. Then swap it over to the Air Fryer feature and cook until nice and golden brown. To be honest the pressure cooker aspect really helps speed up the process of breaking down the potatoes enough. Then swap to the air fryer to really crisp up the outside of the fries and work in the garlic, parsley, and parmesan flavors. You will never want to buy frozen fries again, once you start making your own homemade version. Simple, satisfying, and highly addictive is what you get with these savory garlic fries made in the Ninja Foodi! 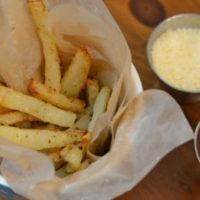 Have you tried garlic fries before? The most delicious Garlic Fries you can ever make at home. Pour water into your pot. Place cut potatoes into the crisp basket and place into the pot. Place your pressure lid on and secure. Move pressure release valve to seal. Select pressure, set to low. Set time to 3 minutes. Press Start. Combine melted butter, chopped garlic, parsley, & Parmesan. When pressure cooking is done. Remove the pressure lid. Pour melted butter mixture over fries. Close crisping lid. Press Air Crisp, set temp to 400 degrees, set time to 18 minutes. Press Start. Check potatoes after about 10 minutes. Give them a shake if needed (use pot holders, the crisp basket will be hot) You can also move them around with a fork. You will want to adjust them some, so that they are cooking evenly. Continue to cook until they reach your preferred crispness. Any thoughts about changes to timing if using sweet potatoes instead of Idaho potatoes? I would shooot for about the same time. You will be opening your lid and checking on your fries and moving them around some as they cook so you can tell easily when they are all ready. I bet they will be delicious!! After the pressure cooking time has finished, do you then drain whatever water may still be in the pot BEFORE you aircrisp? Can’t wait to try! Looks delicious! Do you soak your potatoes before slicing/pressure cooking? I just did these but in big cubes with the skin on and they were delicious!